Commenting on the state of menswear is a job for an experienced, established and critically acclaimed designer. Basically, Raf Simons. Having been part of setting many of the standards younger designers today try and live up to, the Belgian designer has in recent years decided on more of a philosophical approach to his collections. And for Autumn Winter 2012 it is fair to say that Simons might even have taken a conceptual stance. Because rather than zooming in on a particular fabric, colour or detail, Simons turned to the old trick of oversizing garments and playing with proportions. I say 'old trick' - it has been done before - but each designer of course does it from his or her own set of circumstances. Hence Simons' way was unique and forward-thinking compared to his own aesthetic. "I was interested in changing the silhouette of menswear"
Using tight shorts for the bottom half, Simons allowed for oversized garments to appear even bigger. The proportional game was most evident in his shirts, of which some were layered with a collar a dozen sizes too big over a normal-fitting shirt and tie. Other shirts were voluminous and tucked into the trousers for a bigger effect, and the third kind of shirt was as long as a coat and worn as an outerwear garment. Most of these pieces were bottle green, burgundy or navy, but towards the end we also saw a range of floral versions. "The strands of hair was meant to be quite symbolic. People change the colour of their hair often, it's an easy way to change something about yourself quite quickly"
Raf Simons: well, like for example, the white shirt can also be outerwear and how the suit look can be expanded by adding shorts. DD: How come you chose to go big and on the top and tight on the trousers.... you've done wide legs in the past! Raf Simons: Actually, the shorts are not skinny. They are quite relaxed actually, there's two or three centimeters extra fabric around the knee. They're almost skate in a way, they just look slim because they are in the same fabric as the blazers. I would say they are quite streety in a way. I like this idea of contrasts - very small and very big, controlled and free, street and luxury - and how to blend them. DD: What was the idea behind the attached strands of hair? Raf Simons: It was meant to be quite symbolic. People change the colour of their hair often, it's an easy way to change something about yourself quite quickly. 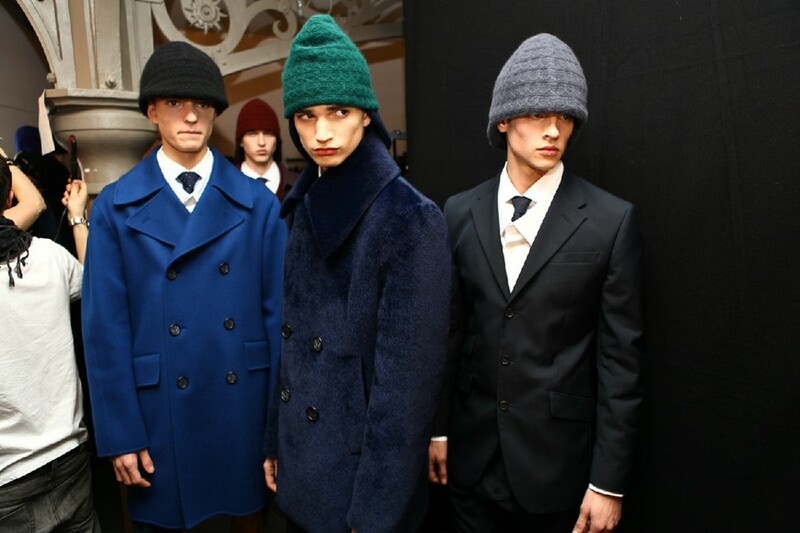 Raf Simons: Yeah, thet were like a mixture of caps and hoods!